Joanne Klepeis Allain is a national RtI consultant with 3t Literacy Group, works with states, districts, and schools across the country to develop, implement, and coach practical, customized RtI plans and instruction. Her career experience at both the classroom and district level provides the unique perspective of a practitioner in real schools with real children. As part of the planning process, Joanne focuses on the multiple roles educators play in increasing student achievement and providing the collaborative expertise needed for a comprehensive program. She works closely with RtI teams, teachers, and administrators at primary, intermediate, middle, and high school levels. 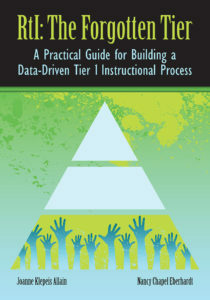 Joanne is the author of Logistics of Literacy Intervention: A Planning Guide for Middle and High School and Logistics of Literacy Intervention: An RtI Planning Guide for Elementary Schools.